60% of the normal walking is spend on Stance Phase and the remaining 40% in the Swing Phase. Each phase, in turn, is divided into smaller components. 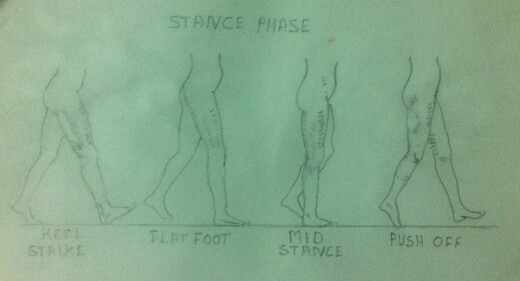 The Stance Phase has four components namely Heel Strike, Foot Flat, Mid Stance and Foot Off. The Swing Phase has three components namely Acceleration, Mid Swing and Deceleration. In this article an attempt is made to analyse the problems that may interfere during the different components of the Stance Phase. Most of the problems in the Stance Phase is due to pain. Weakness of muscles in the lower limbs also causes variations in the normal gait pattern during Stance Phase. The pain causes the patient to walk with an antalgic gait. 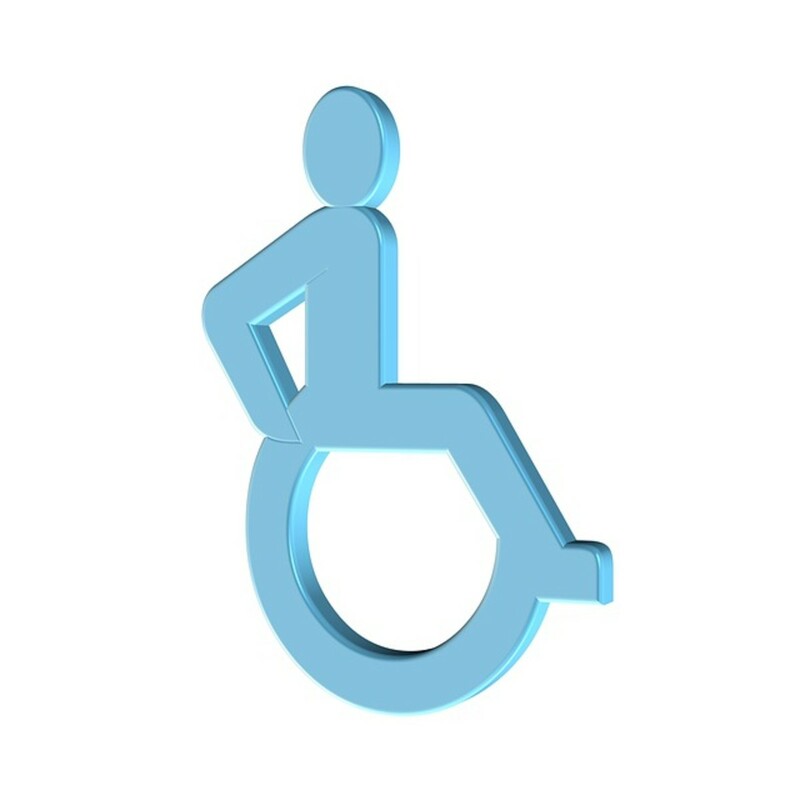 Because of pain the patient tries to remain on the involved lower limb for as short a time as possible. In severe painful conditions he may try to avoid the Stance Phase components altogether. Shoe problems may also cause the gait painful. Patients with shoe problems may have pain in all components of Stance Phase, resulting in an antalgic gait. Bent or roughened lining of the shoes, too small or too large shoes and narrowing of the shoe toes are some of the common problems that cause pain during gait. Any loose object that might get trapped in the shoes may also cause pain. The patients with instability will have wide based gait. In such cases the width of the base is always more than 4 inches from heel to heel. The instability of the gait may be because of any of the following reasons. The patients with sensory impairment on the soles of the foot due to diabetes or due to any peripheral neuropathy conditions we have broad based gait to gain stability. 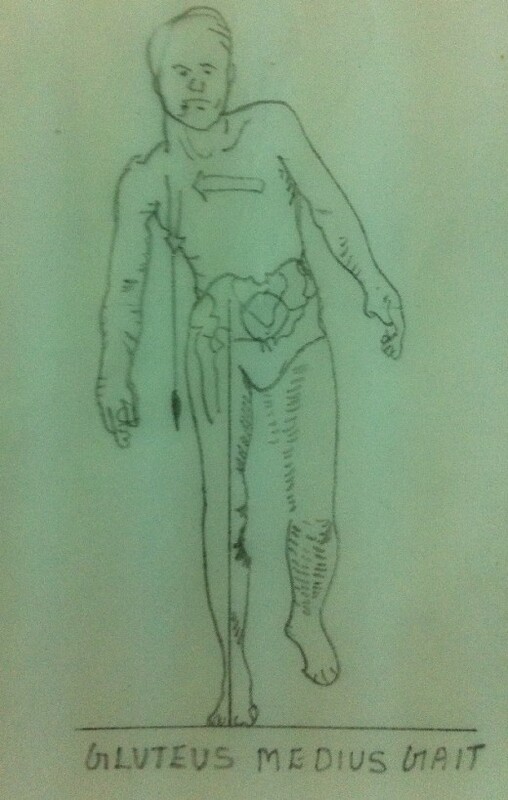 They usually look down and look at their feet to orient themselves in relation to space and the ground. The patients with cerebellar problems may have difficulty in maintaining their balance and hence may resort to a wide based gait. 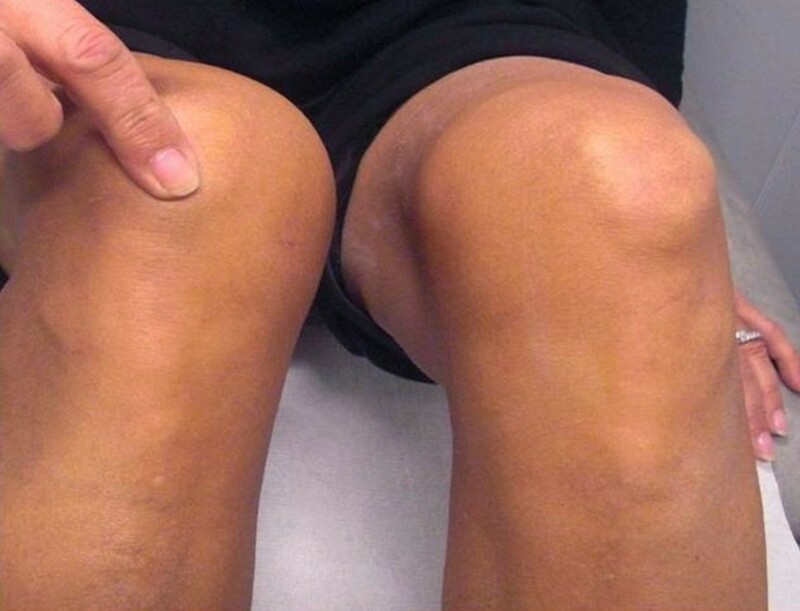 The patients who have the problem of dislocation of patella will have an unstable knee resulting in frequent sudden falls due to unexpected knee flexion. The patients with torn menisci and collateral ligaments have unstable knees which may buckle. Now let us examine the various components of Stance Phase and try to find out how various problems interfere with each joint during the Stance Phase. Foot – During Heel Strike the foot pains because of a heel spur, a spike of bone which protrudes from the medial tubercle on the plantar surface of the Calcaneum, the heel bone. The heel spur causes very severe and sharp pain when the heel is down hard on the floor. 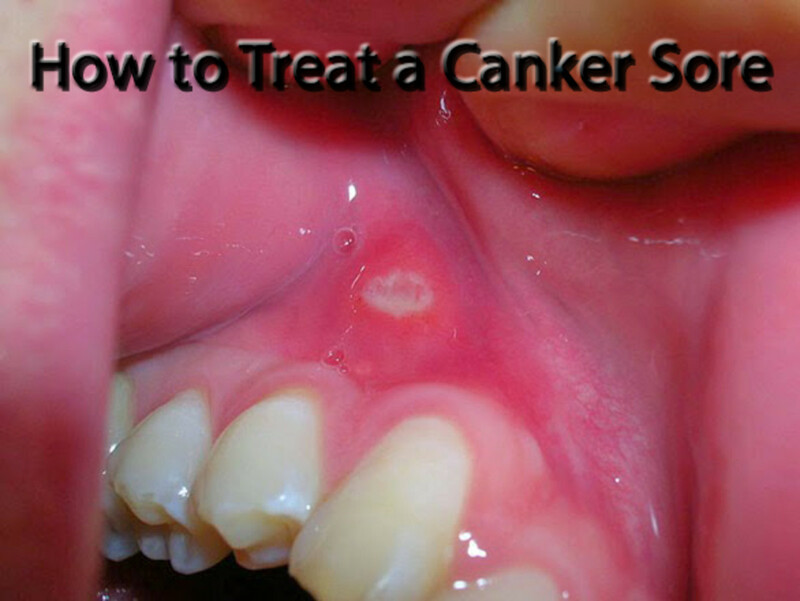 At times, a protective bursa may develop over the spur. In the course of time the bursa may get inflamed due to repeated trauma resulting in bursitis, causing severe pain. 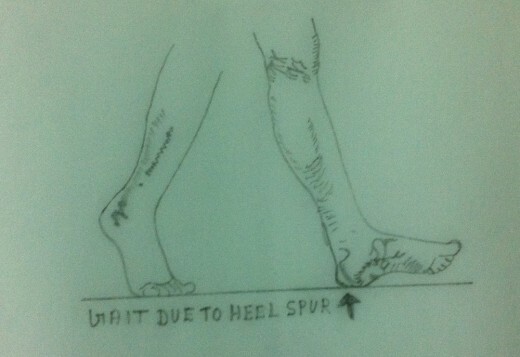 In such cases the patient tries to avoid the heel strike by hoping on the involved foot. Knee – In the case of normal gait, in the Stance Phase, the knee is usually extended at heel strike. The extension of the knee is essential for the gait to proceed further and it is done by the contraction of the Quadriceps Muscles. In the case of weak Quadriceps Muscles, the knee extension does not occur. In the absence of knee extension, the knee becomes unstable and hence the gait becomes very difficult. Somehow knee extension is essential for the gait to proceed. 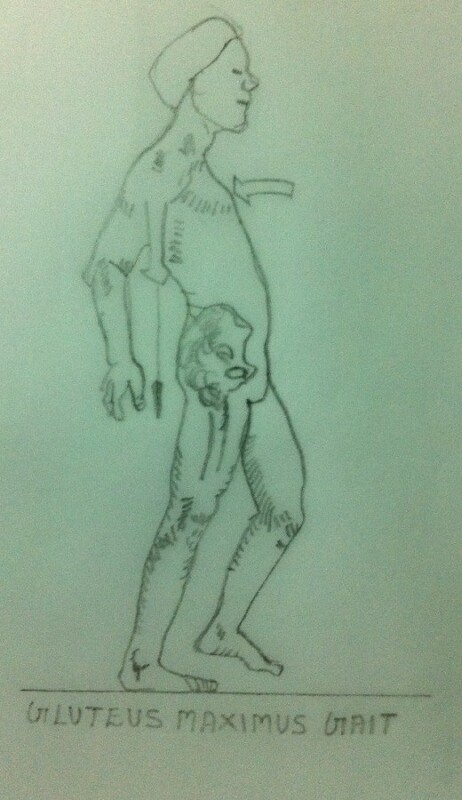 This is attained by a conscious effort on the part of the patient by pushing the knee in to extension by his hands. 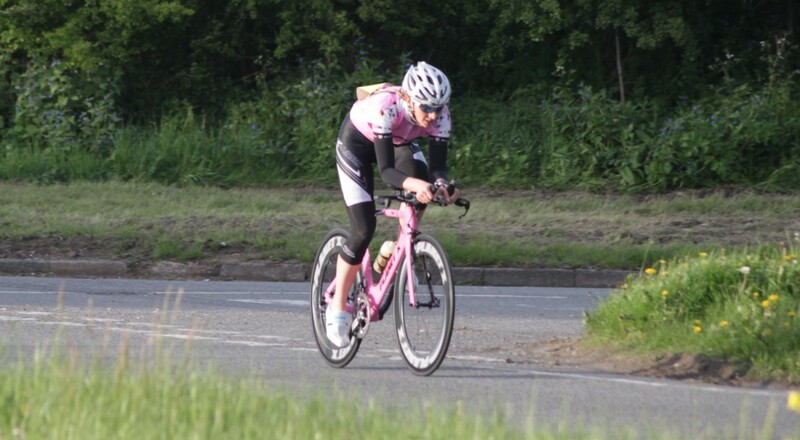 In some cases the extension of the knee is attained by forcefully ‘slapping’ the knee backwards. 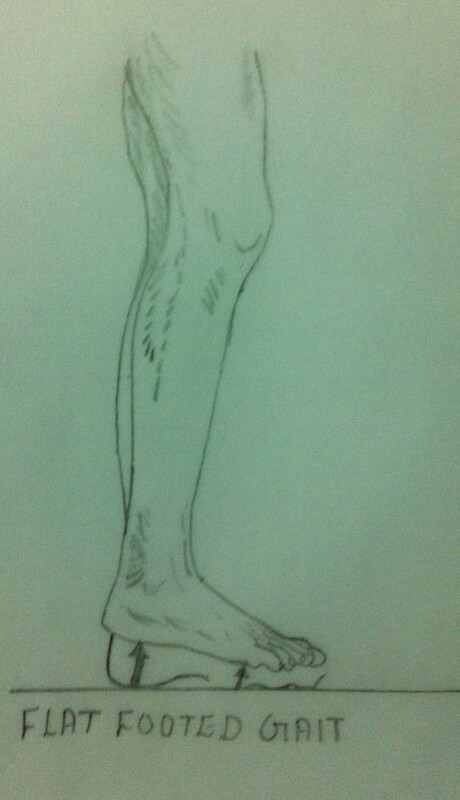 In short, the patient walks with a ‘back knee gait’ to lock the knee in extension. 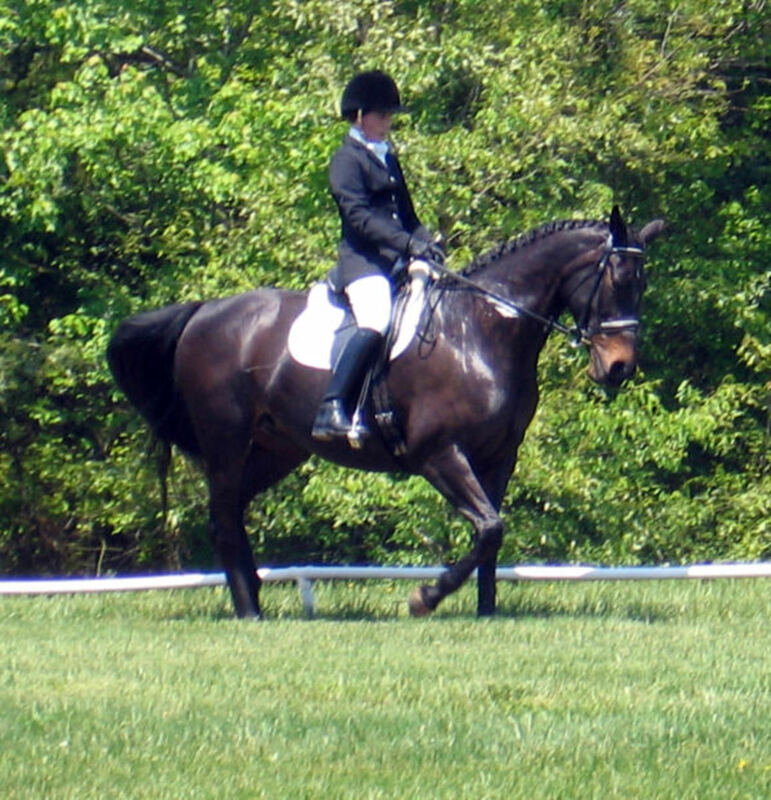 The same problem may arise in cases where the knee is fused in flexion. 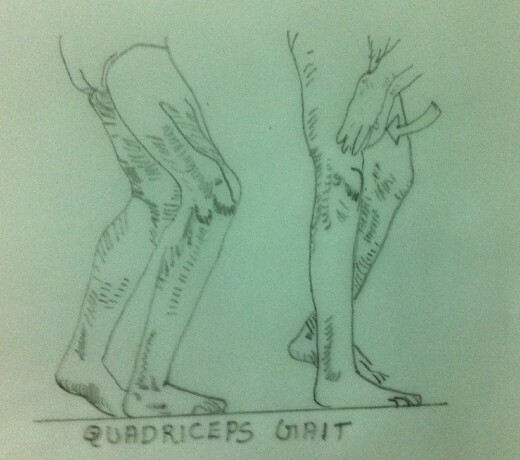 This gait is usually known as the ‘Quadriceps Gait’. This gait may be corrected by strengthening the Quadriceps Muscles or by using suitable Splints or Orthoses. Foot – The dorsiflexors of the foot are the Tibialis Anterior, Extensor Digitorum Longus and Extensor Hallucis Longus. The dorsiflexors of the ankle joint permit the foot to move into plantar flexion through their eccentric elongation so that the foot flattens smoothly on the ground during the component ‘foot flat’. 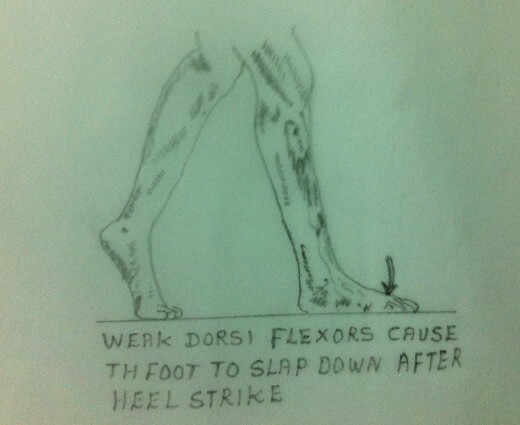 If the dorsiflexors of the ankle are weak or non-functioning, smooth flattening of the foot is not possible. Hence, in such cases, the patient may ‘slap’ the foot down on the floor instead of letting the foot land smoothly. Foot – In normal gait, during Mid Stance, weight is equally distributed on all aspects of the plantar surface of the foot. Patient with a flattened and collapsed longitudinal arch (pes planus) or with a subtalar arthiritis may have pain during Mid Stance, while walking on uneven surfaces. This is because even distribution of weight is not possible in such cases. 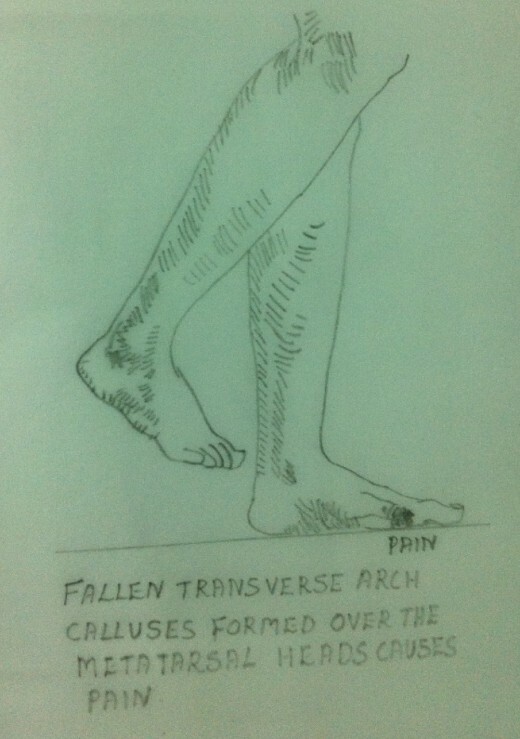 Patients with collapsed transverse arches of the forefoot may develop painful calluses over the metatarsal heads causing pain during Mid Stance. 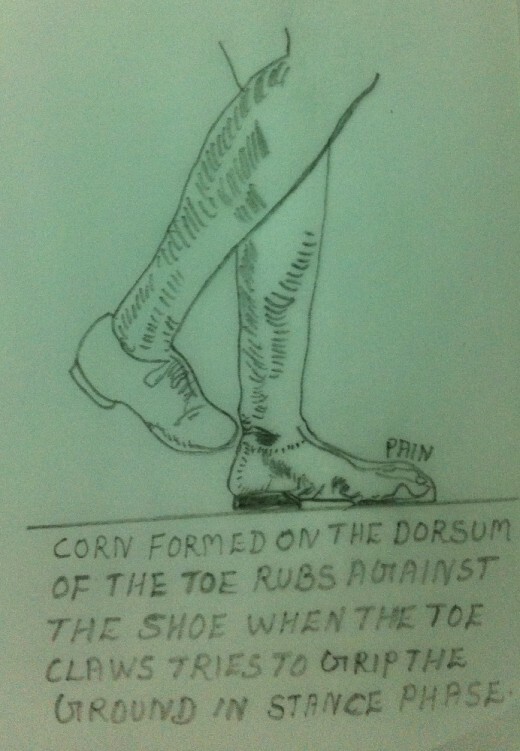 Corns formed on the dorsum of the toes may also cause pain during Mid Stance. This is because these corns may rub against the shoes when the toes try to grip the ground during Mid Stance. Knee – During Mid Stance, usually, the knee joint is not straight. But the Quadriceps muscle contracts to hold the knee stable. Weak Quadriceps muscles cannot contract properly to hold the knee stable. Hence the weak Quadriceps muscles may result in excessive knee flexion and hence leading to a relatively unstable knee. Hip – During Mid Stance, there is about one inch of lateral displacement of the hip to the weight bearing side. If there is weakness of Gluteus Medius (the abductor of the hip), the patient will have a tendency to lurch towards the involved side to place the centre of gravity over the hip. Such a movement is called ‘Abductor lurch’ or a ‘Gluteus Medius lurch’. The gait is called the ‘Gluteus Medius Gait’. If there is weakness of Gluteus Maximus (the extensor of the hip), the patient will have a tendency to thrust his thorax posteriorly to maintain the hip extension. Such a movement is called ‘Extensor lurch’ or a ‘Gluteus Maximus lurch’. 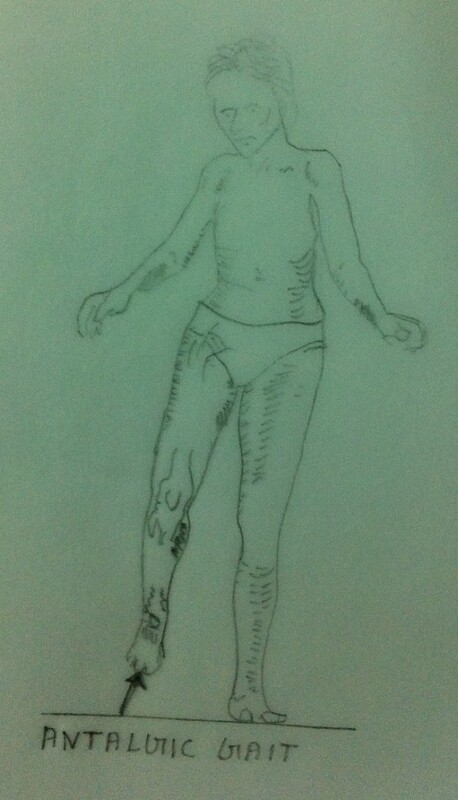 This gait is called the ‘Gluteus Maximus Gait’. Foot – In order to have a smooth Push Off, a pain free first metatarsophalangeal joint with full range of motion is very essential. This is because the Push Off usually occurs at the first metatarsophalangeal joint. If the patient has osteoarthritis or a partially or fully fused metatarsophalangeal joint (hallus rigidus) he may be reluctant or unable to hyper extend the metatarsophalangeal joint of his big toe, which is essential for Push Off. This is because of pain. 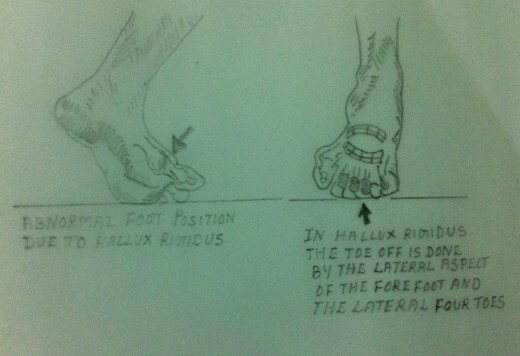 In such cases the patient may be forced to take the Push Off from lateral side of his forefoot. This maneuver causes much discomfort and pain to the patient during the Push Off. 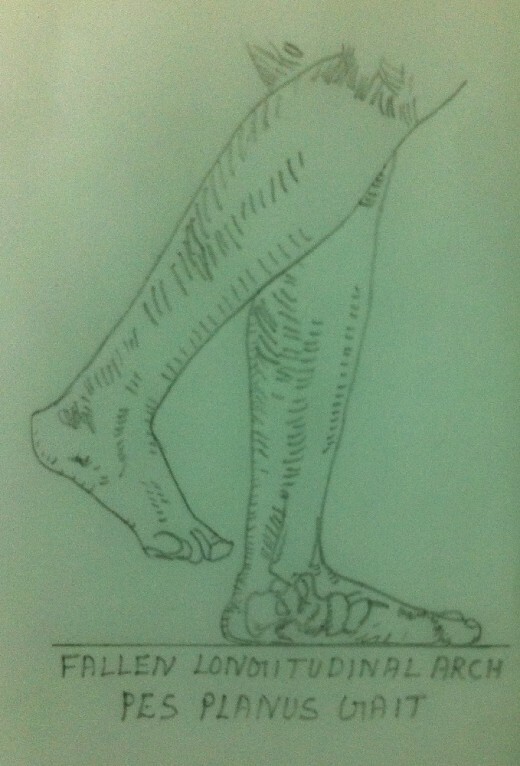 In such cases the patient may avoid the Push Off component and prefers a ‘flat foot gait’. Push Off is also painful in the case of patients with ‘metatarsalgia’. Knee – The Gastrocnemius, Soleus and Flexor Hallucis Longus play an important and vital role in the case of Push Off. Weakness of these muscles result in a ‘flat foot gait’ or a ‘calcaneal gait’. ‘Calcaneal Gait’ is walking on the heel with the forefoot lifted up.